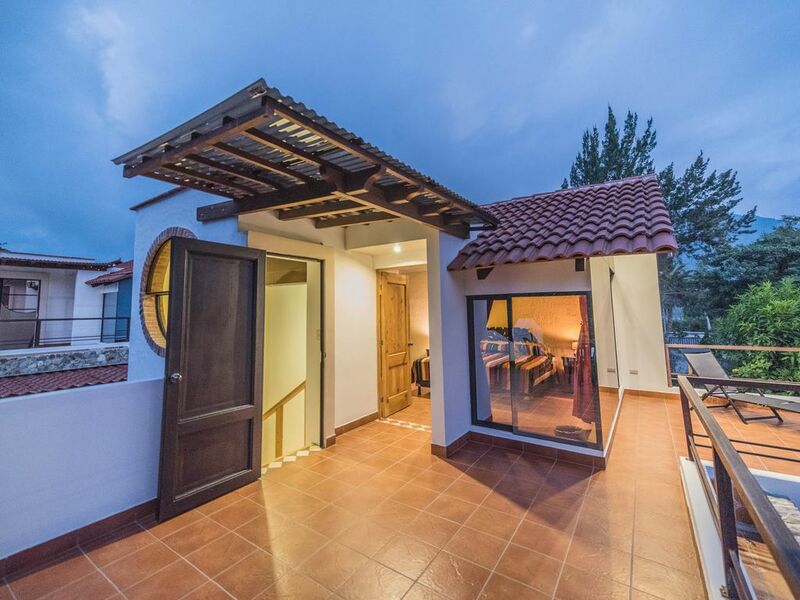 Villa Jucanya 3, is the name of the third property of "Villas Jucanya", a complex of 5 Villas located in front of one of the most beautiful lakes in the world, "LAGO DE ATITLAN", 15 minutes from the center of Panajachel (walking) and 5 min by car. Our Manager Aaron Salguero, can call you a TukTuk (three wheels taxi) they charge between Q 5.00 (GQT) and Q 10.00 (GQT) depending on time. Lake Atitlan t is a place to rest with family or friends, with a big beautiful garden, 30 meters distance from the lake shore and surrounded by 3 volcanoes, mountains and lots of vegetation. Several different cultures mingle on Panajachel's streets. Ladinos (people of mixed indigenous and European heritage) and other expats control the tourist industry. The Kaqchiquel and Tz'utujil Maya from surrounding villages come to sell their handicrafts to tourists. My family and I have decided to share our property with other families who want to travel to Guatemala and know the beauty of Lake Atitlan in Panajachel, Solola, Guatemala... With my family we have really enjoyed this property facing the Lake and we have many extraordinary memories lived in this beautiful place. You have to come and know this amazing place !! This Villa has been constructed with the idea of a special place for family recreation. The Villa is comfortable, spacious and with a beautiful garden. From the living room you have a wonderful view of the garden and Lake Atitlan as well as a breathtaking view of the volcanoes around the Lake. "Truly Awesome"
At 5 min by car. We can wash your clothes for an extra charge of Q 45.00 (GQT) per load. We provide welcome coffee and our coffee maker doesn't need any paper filter. Water for drink provided. Enjoy a welcome package of: salt and pepper, sugar, olive oil, coffee and tea. SMART LED TV with NetFlix HD. Our manager, Aaron Salguero, is on site, he will be happy to arrange any outdoor activity and is the person in charge of your stay. First all, the manager Aaron treated us like we were very special. He now has a Venezuelan restaurant which serves food that is off the chart. He arranged our boat rides and took care of every last detail. Our laundry came back tied with bows for each bundling of shirts, pants, etc. The views are beautiful and the housekeepers are friendly and they show up every day. I would highly recommend Jucanya. Great time here at the property. Everyone was welcoming, and the local market and lake are close by! Property is as pictured. Nice place. Everything you need. A lake view. Nice house. Everything you need. A little out of town but an easy walk or tuk-tuk. Communication was really good and help on-site was fantastic. What a great place!! Met beyond our expectations! We were so happy and pleased to have stayed here! Everything, and I mean every thing about this place, was perfect! The views from this home were espectacular. The kitchen was fully equipped and the bathrooms were very clean. The whole experience was just the best! Aaron, the manager, was so efficient and helpful! He helped us getting in-home services and a guide for our site seeing. We couldn’t have done it without him, he was like the cherry on top to this great adventure. Can’t wait to go back!! Our Manager, Aaron Salguero will be happy to arrange any activity around the lake.